Does This Painting Need To Be Cleaned? Isn’t this girl pretty? She was painted about 1860. Note the cleaning test of varnish removal on her neck (and on the pearls). 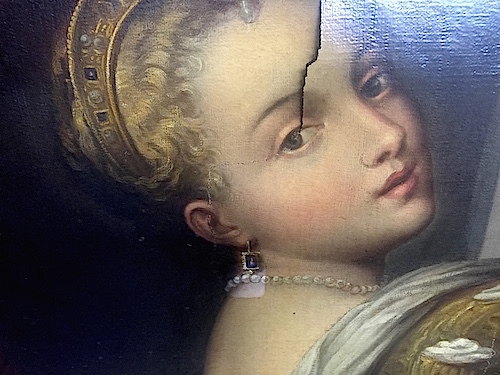 You can see that she has more problems than just yellowed varnish (in fact she has several patches from past restorations) but we’ll only discuss the cleaning question of oil paintings in this article. Does this old oil painting need to be cleaned? A question that comes up often with curators at museums, dealers and auction houses is, “Does this painting I’m looking at, need cleaning?” Well, that’s not a “yes” or “no” question. Certainly, a yellowed varnish changes the look of the original colors: A badly yellowed varnish usually turns purples to brown, it kills pinks, of course turns blues to green and orange to red… in other words, there is a complete shift in the true colors of the artwork. Add to that the grime, smoke etc that in the air and if an artwork hasn’t been cleaned in 100 years… well, you can imagine how changed the colors of the paint on the walls in your house would look if they weren’t cleaned in 100 years. In addition to the changing of the original colors, depending on the clarity of the varnish, with the accumulation of grime etc… the saturation or brilliance of the colors is sacrificed and the depth of field, or 3-D effect, is flattened considerably. So even with all these changes, does the artwork need to be cleaned? Well, maybe, maybe not. Some artwork “looks better” to the world of collectors if it has the “glow of the ages” or “Titian’s dirt.” Primitively painted Early Americana and Spanish Colonial paintings are usually accepted as better if they are not cleaned completely. In fact, some of them are “antiqued” on purpose so they don’t look so garish or cartoonish… these types of considerations, however, are made mostly for artwork that has decorator value (or lower financial value) though, not for original valuable works of art. There are also differing schools of thought. Some like old paintings to show their age supposing there to be a romantic story to be told. 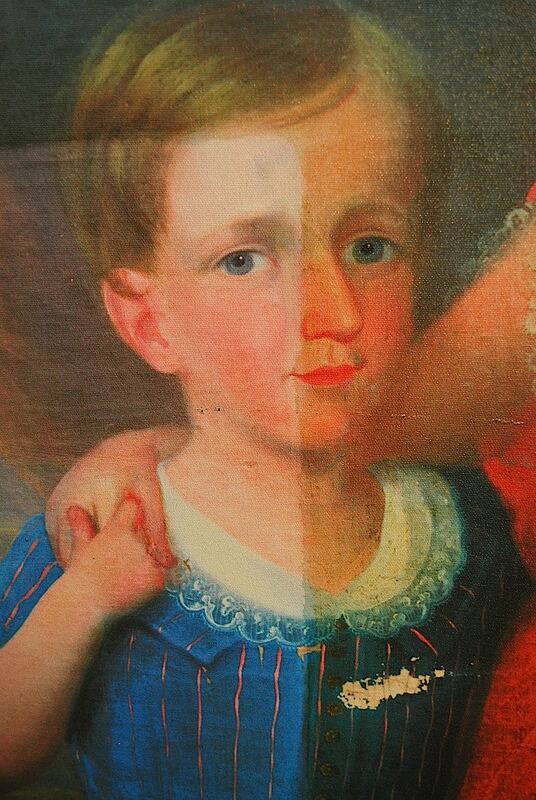 But I suspect that some dealers like to sell dirty paintings because its easier and cheaper to hide restorations. The National Gallery in London likes their artwork to look as close as possible to the intent of the artist… therefore, cleaned. Cleaning, mostly is a matter of taste. If you like the “glow of the ages” on your romantic paintings then leave them uncleaned. A yellowed varnish is not a preservation issue. Its an aesthetic issue to be decided by the “curator of the collection” (that might be you?). Sometimes, however, restoration of missing paint on an oil painting might be more accurately inpainted if the painting is clean and the painting conservator can match original colors. One more consideration for cleaning; Usually, clean paintings are easier to see and enjoy their details than dirty artwork. Only with a bright dedicated light will a dirty painting look good… but then again, a clean painting looks more fabulous with good light on it too. If you decide to have your painting cleaned, the next issue to address is to make sure the process is done safely. It is not an exaggeration to say that more works of art have been damaged and destroyed by inept cleaning that my all the floods, volcanoes and earthquakes in history since the beginning of time. For a quick time lapse video of a time lapse cleaning of an early California Impressionist painting by Edgar Payne, click on this link: https://www.youtube.com/watch?v=-DSzHcEBZ40 Give the video a thumbs up and leave a 5 star comment?!?! For a quick time lapse video of cleaning family portraits, click on this link: https://www.youtube.com/watch?v=IyjI3rgCcF0 Leave a comment in the area under the video. This entry was posted in In Lab, Painting on canvas and tagged cleaning an oil painting. Bookmark the permalink. 2 Responses to Does This Painting Need To Be Cleaned? Thanks Roger for your comment. I had recently watched a television show where a piece of artwork had been destroyed and they had reached out to someone who restores art as a career and I had no idea that it was something that took so much skill. I really liked that you mentioned the importance of understanding when a professional is needed specifically when it could just be the paper fading over time. If I were ever to a point where I could afford expensive artwork, I’d hope that I could get it restored when needed.